I secretly shake my head ever so slowly. I am not yet OK with the labels associated with competing with TeamUSA. Truth be told, I hope I never find them to be commonplace. Just this last week, at a professional event, I asked a couple of different folks if they wanted to go running with me. They all came up with an immediate excuse. “I can’t go as fast as you,” or “I can’t go as far as you.” These folks were often half my age and dedicated athletes themselves, out on the road more days a week than I was when my foot was damaged. I am just a middle-aged guy, who happens to have an athletic tint to his being…I guess that intimidates some folks. At the same time, I need a new challenge, as there are no national or world level competition for duathlon in the immediate future. It is time to do something for others with my skill for others. I found a perfect fit. Many of you know that I have worked in Nepal for years. Two of the schools there have made requests in the last few months to get solar arrays placed on their schools, as they don’t have power for computers or even lights. This small country gets all of its energy from inadequate resources, and there is no electricity for schools during the day. Combine that with a lifelong dream to run the Boston Marathon, and out comes a new plan. To run Boston, I need to do some Marathons to qualify. As a first step, I am training for an Ultra Marathon that will raise money for Solar Panels in Nepal. The one I am doing is a 50k trail run on the shores of the Catawba River around the US National Whitewater Center. I am asking for folks to sponsor me… $1/km or $2/km. All of the proceeds will go to paying for solar panels and inverters for two different schools in Nepal. 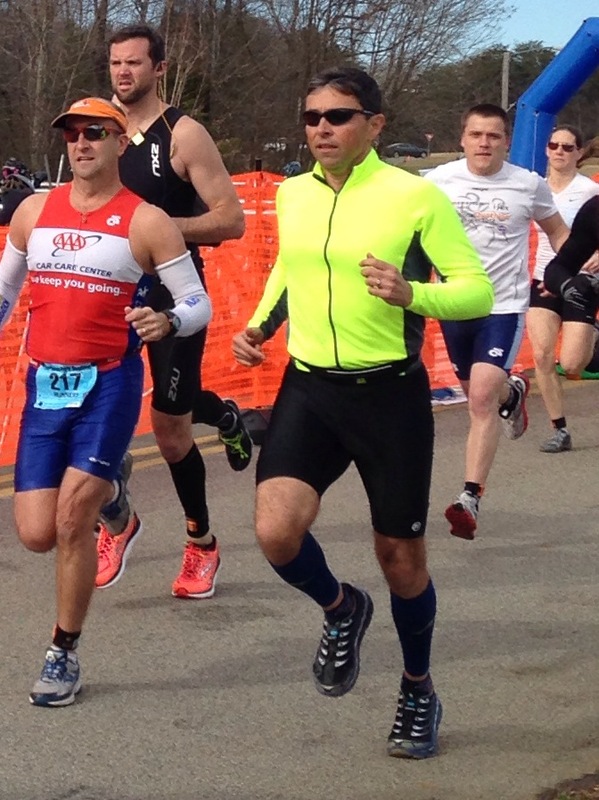 To get ready for this event, my focus is totally different than preparing for a Duathlon. I spend much more time running, and, with the changing lengths of days, I find myself running early in the morning, wearing a headlamp. Since the distance of my training runs is so much longer than I am used to, I drive the route the night before and leave food and drink caches on the route. When I reach milestones on the run (mile 5, 10 or 15, for example), I get a drink and some carbs. I look forward to reaching the snacks…like a mini Christmas hidden in the bushes on the sides of the roads! Being in sustained cardio mode in the hot days of summer means clothing selection is a big deal. Everything I wear is soaked at or before the halfway point, and its weight doubles! Wearing anything cotton is out of the question. That said, a 2 or 3 hour run before starting work gives me a mental clarity that I don’t normally get if I wake up and go right to work. I fly to Nepal on October 23 for 11 days. While in Nepal, I will climb on roofs with solar panels and meet with villagers whom I have known for literally 26 years, back to when I was a Peace Corps Volunteer. None of your donations shall go towards buying my plane ticket…my wife and I funded that. What are you setting as your new goal? Do Life changes have you thinking about what to do as a physical challenge? Look inside…not outside, and you will find a dream that goes back to childhood. I did.